Enclosed garden with garden furniture, safe for children. External laundry room with washing machine and central heating boiler. shower room. Open staircase with gate leads to mezzanine with 2 single beds, cot, high chair, bedroom in tower with double bed, single bedroom and family bathroom. Key holder/housekeeper lives nearby, French speaking only. Village of Nancras, 10 mins walk, has village shops. Nearest beaches at Royan. Town of Saintes with Roman arena and remains 15km. La Rochelle 60 mins. Bordeaux 90mins. Cognac 40mins. Airports at La Rochelle and Bordeaux. Ferry port St Malo. As a lover of France and a French speaker, in 1995 I purchased. 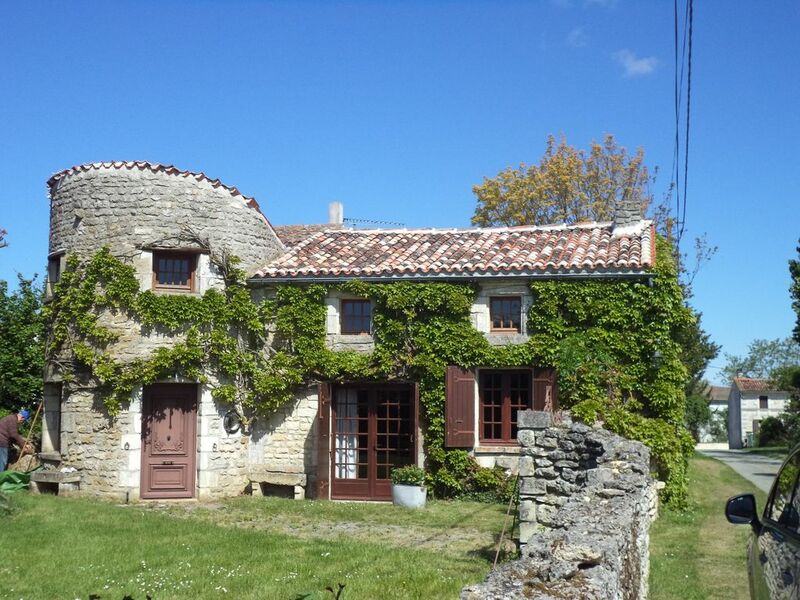 ‘La Ruche’ which was formerly a wine ‘chai’ in the Charente Maritime near the coast in western France to offer for holiday letting. This was subsequently extended adding an upstairs modern bathroom and extra bedroom. The property is situated in a small hamlet with in countryside but not far from the coast. We have visited this area for many years and have made many friends. Charente Maritime is famed for the clarity of light which has attracted many artists and the hours of sunlight which match those of the south of France. The property has radiators with oil fired central heating. Towels except for swimming/beach provided. Seating for 6-7 - sofa and easy chairs. TV French only. Fridge with freezer section at top. All equipment, saucepans crockery, cutlery etc provided. Long table in living room with bench seating. Also dining facilities in kitchen. In living room games /book cupboard. In games cupboard in living room. Garden furniture provided. Enclosed garden back and front. Lawn. Sandy beaches, pine forests, islands, boat trips, seafood, lighthouses, historic ports and lots of sunshine. What more do you want except to stay on! Historic city on Charente river and centre of Cognac-producing area. Visits to famous distilleries eg Hennessy, Otard, where you can taste and purchase Cognac on-site. Talmont with its church overlooking the Gironde Estuary and famous for hollyhocks. Brouage harbour where the sea has receded and birthplace of Champlain, founder of Quebec in Canada. North-east of Saintes (towards Rochefort along the N137), La Roche Courbon has an impressively located chateau tucked away in an ancient forest. As well as the finely furnished castle and beautifully maintained French-style gardens, there is a prehistoric museum and some small caves to see, plus picnic areas etc. Visit Ile d'Oleron's beaches and seafood restaurants. Ile d'Aix, exile of Napoleon, only accessible by boat. Ile de Re, near La Rochelle, holiday area of the rich and famous is only an hour's drive away. Enjoy a family day out at this zoo in the pine forest on the coast. 1600 animals in a natural environment. Historic town with port and fortified ramparts. Rural hamlet in wine-growing area with nearby farm and horse riding. Undulating countryside ideal for cycling and walking. Outdoor swimming pool at Saujon 8km, 20 min drive to coast. At Trizay nearby there is a lake, chateau and garden where there are swings and slide for small children. La Ferme de Magne, St Gemme, 3km. Cadeuil 4km. Moulin de Chalons le Gua 7km. Hotel des Acacias, Corme Royale 3km. Pineau is a speciality of the Charentais region, an aperitif combining cognac and wine. Can be tasted and purchased at the nearby distillery where the producer will also give you a tour. Ferme de la Magne 3km has themed restaurants, ostrich park and farm for miniature animals. Moulin de Chalons at le Gua 3* restaurant hotel in restored mill. Hotel des Acacias at Corme Royale. 18th century town and port on the Charente River with the Corderie Royale famed for rope making, Hermione warship now re-created and a centre for begonias! All year round coastal resort. Particularly recommend Un Violon sur le Sable, free music concerts held on beach in July. Colourful daily morning market with fresh produce especially fish, oysters caught locally. Also pineau, local aperitif. Roman town on the Charente River, with Roman arena and arch where you can explore the river by boat. International Music Festival held in July. An important fishing port about 30 kilometers from Talmont-sur-Gironde, the village of Mornac-sur-Seudre is renowned for its oyster farms and salt marshes. The village is listed as one of France's Plus Beaux Villages because of its impressive Romanesque architecture. The 11th-century Eglise Saint-Pierre is especially noteworthy. The village has a peaceful setting in the marshland near a sheltered sea port. The town of Pons is situated in the countryside of the southern Charente-Maritime department and about 20 kilometres south of Saintes. The town originally developed because of its position on one of the important pilgrimage routes across France - the so-called 'Via Turonensis' that starts from Paris and follows western France before entering Spain to continue westwards to St Jacques de Compostelle. The medieval centre of Pons is well maintained and has several buildings of interest for visitors making it one of the most popular and interesting tourist destinations in the area. The town was once an important regional centre controlled by the Lords of Pons, who established an imposing castle here. The castle and its associated ramparts and donjon (castle keep) still dominate both the town and the valley of the river Seugne below - the views from the castle walls are one of the highlights of your visit.